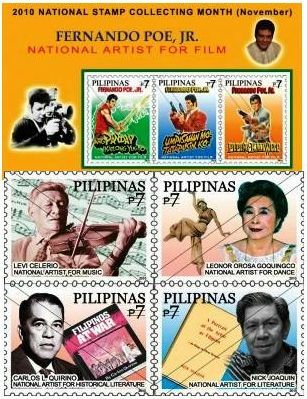 Manila (10 November) -- Five National Artists led by the late Fernando Poe Jr. will be honored Wednesday, November 10, 2010 by the Philippine Postal Corporation (PhilPost) through special stamps to celebrate the 227th anniversary of the Philippine Postal Service. Other National Artists to be honored are literary giant Nick Joaquin, historian Carlos Quirino, performing artist Leonor Orosa Goquingco and musician Levi Celerio. Mary Grace Poe-Llamanzares, chairperson of the Movie, Television Review and Classification Board (MTRCB) is the special guest at the launching and opening of the stamp exhibit for the National Stamp Collecting Month (NSCM), held at the lobby of the Manila Central Post Office in Liwasang Bonifacio at 10:00am. Chairperson Llamanzares is accompanied by Ms. Susan Roces, widow of the late Movie King and national artist. Philpost Chairman of the Board of Directors Alfredo Gabot and Officer in Charge-Postmaster General Antonio Z. de Guzman led Philpost officials and employees in paying tribute to national artists whose works brought pride and honor to our country.